Media Attacks Gun Dealer Who Sold Firearms To Christchurch Shooter. There's Just One Problem. 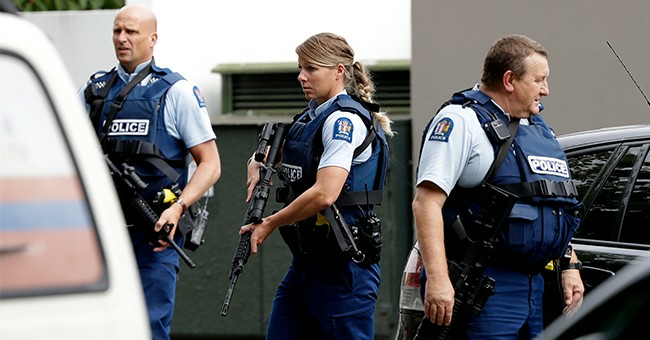 The man who carried about the deadly attacks in Christchurch, New Zealand, Brenton Tarrant, legally purchased firearms from Gun City, a New Zealand chain gun store. According to Gun City CEO, David Tripple, Tarrant legally purchased four firearms from him between November 2017 and March 2018. “We detected nothing extraordinary about this license holder,” Tripple said, according to the Manila Bulletin. Although Tripple sold numerous firearms to Tarrant, he said the AR-15 that was used in the attack was not one his business sold, Newshub reported. "I watched the video, I saw the rifle and I know for sure where it came from if it has a serial number I expect and it is not affiliated with any Gun City store," Tripple told the media during a press conference. The media was quick to come after Tripple for selling firearms to the shooter. One reporter asked if Tripple felt responsible for the attack, to which he replied, "No, I do not." He said it was the responsibility of police to vet those who applied for a "class A firearms license," which Tarrant had. "What we are doing is legal and the majority of people have put in place the Government that set those laws and we are abiding by those laws, which enables us as citizens to peacefully enjoy legitimate activity," he said, Stuff reported. Reporters asked Tripple if he would close his store if the victims' families asked him to do so. He responded by telling a story about his grandson. And it clearly translated to "No." "I had my grandson ask me 'granddad why would people say guns are the problem? The guy was crazy.' He's six," he replied. Others tried baiting him into talking about gun control, something Tripple said he wasn't having. "This man wrote in his manifesto that the purpose of using a firearm was to divide us; if we allow him to make changes in our ideology and our behaviour then he's won," Tripple said. The media is so quick to spin facts to fit their progressive, anti-gun agenda that they're willing to place blame on the gun dealer, even when his company did nothing wrong. 1) Every firearm Gun City sold was sold legally. If anyone takes issue with the gunman obtaining firearms, they need to take it up with the authorities. They're the ones who approved Brenton Tarrant's class A license. 2) Tarrant didn't seem suspicious when he purchased his firearms. And he had been vetted by police because he had said license. 3) The AR-15 that was used in the attack wasn't purchased at Gun City. Trying to connect the two because he bought other firearms there is stupid. And it's like comparing apples to oranges. 4) Even if Gun City did legally sell the firearm to Tarrant, they can't be held responsible. The buyer was licensed. He wasn't acting suspiciously. And the gun dealer didn't pull the trigger. Placing blame on the gun dealer does nothing but remove personal responsibility from the equation. If people know they'll never be held responsible for their actions. Get in an accident? Blame the car. Gain weight? Sue the soda company. Fall from a latter? Go after the manufacturer. At what point do we stop blaming everyone else for this massacre? He took 50 lives. Not the gun dealer. Not the ammo manufacturer. Not the gun maker. Him.